Your choices will no doubt differ from our eclectic lists, because there’s so much great stuff from which to choose. We hope you feel inspired to leave a comment and let us know your “fave five”! I sat next to a girl once and desperately wanted to kiss her. So I screwed up my courage and leaned in… and it was wonderful. In another universe, we both knew that we would have been for each other. But in this one, because the stars aligned in a different direction, we weren’t. This beautifully heartbreaking song by Rose Cousins was written for the two of us that live in this universe, and everyone else like us. We all have dreams when we’re young. We’re going to change the world. Life will be a grand adventure. We’ll travel, and live and laugh and love, and make every minute of every day mean something. And then one day we hear a sound. It’s faint at first, just out of reach. But then it grows louder and louder, until we finally realize it’s the sound of our own subconscious screaming in pain and anger and self-loathing at what we’ve become… at which point we either go on a holiday, or blow our brains out. Either way, the end result is pretty much the same. “Search Party” brings that stark existential truth home. Chiming guitars and a rollicking and carefree summer night classic rock beat serve as the foundation for the strained but honestly resonant voice of John Wesley Chisholm belting out lyrics that could come straight from any young man’s heart, about the kind of girl that every guy falls in love with once in their lives, or least hopes he will. The kind of girl who gives you looks that last for days and days. When I think of Nova Scotia, this is often the first song that comes to mind. When I imagine what heaven sounds like (should such a place exist), I hear the voices of the Rankins harmonizing. 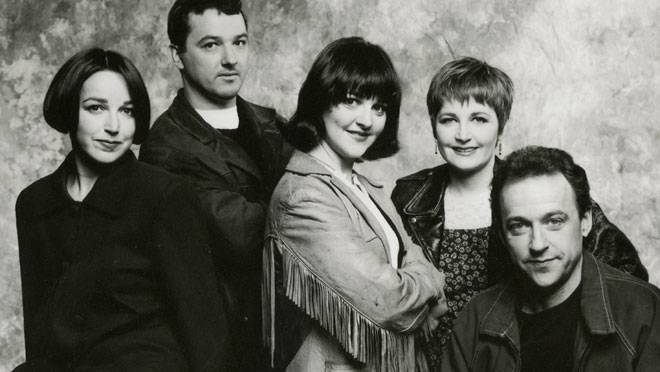 The Rankin Family had so many wonderful songs in their career – “Fare Thee Well Love”, “Gillis Mountain”, “Rise Again”, “North Country”, and on and on – but this one is my favourite. My closest friends will tell you that I almost always refuse to dance in public, the result of my inherent shyness… but this is the one song that I’ll always make an exception for, because it’s just so irresistibly fun. This early 1990s late grunge classic is too fast for shoegazing, too smart for pop radio, and too cool to be ignored. Whether it’s the medieval harmonies (fourths and fifths, mostly) or the deliciously ambiguous wordplay, “Underwhelmed” remains an enduring delight. One of the early classics from the Mabou, Cape Breton band, “Fisherman’s Son” starts with an unstoppable ‘la la la la la la’ chorus and then never lets up. With the three Rankin sisters singing like manic pixies and the full band ramping up throughout, “Fisherman’s Son” celebrates place, continuity, family and lingering traditions with enthusiasm and compassion. It’s the ultimate East Coast singalong song, because the sea is still our lifeline, and the shore is still our home. Plaskett’s playfully existential anthem is also about a place, and that place is Halifax, or Dartmouth, or anyplace that doesn’t seem all that important as long as you’re together with somebody you love, or just desire a lot. Bone-simple, with a chorus that you just can’t shake, “Nowhere With You” contains one of Plaskett’s best ever lines, which reduces the East Coast to an unforgettable few syllables: “I’m so cheap I might as well be free.” Indeed! Way, way, way back in the early 1970s, Bruce Wheaton, Pam Marsh and a gaggle of other East Coasters formed a band named after Sly Stone’s hit “Everyday People”. They signed to GRT Records in Canada and Paramount Records in the USA, releasing a single very potent long-player that featured a six minute early dance-floor epic written by Wheaton that became a wayward hit from San Francisco to New York City. Beginning with pulsating drums, and then gaining momentum with some of the strangest vocal arrangements ever, “I Like What I Like” eventually morphs into an absurdly catchy chorus. Brilliant. Absolutely brilliant. This 1989 song by the four-piece all-female Halifax-based African Nova Scotian acapella group Four the Moment remains one of the all-time great recordings ever done on the East Coast. Written by Delvina Bernard and featured in the opening moments of Sylvia Hamilton and Claire Preito’s NFB film Black Mother, Black Daughter, it brings unadulterated soul and passion to a celebration of community in an a capella tour-de-force. From a group that refused to compromise the integrity of their music by playing the record company game, this is a song that reminds listeners that music sometimes is an end, utterly and completely, in and of itself. Paul Andrew Kimball is a film & television writer, director and producer. Ron Foley Macdonald is a film writer and producer, and was the longtime music and theatre critic for The Halifax Daily News. Both are former musicians who played in a number of bands in the 1980s and 1990s, including Tall Poppies, Julia's Rain, The Fourth Wall, and The Trash Kanz. Hey Friends, just finding a moment to look through your very rich work here at view902. No reactions to your top five songs?! How is that possible?